These Pumpkin Pie Whoopie Pies are packed with pumpkin & autumn spices but they also have the most amazing marshmallow buttercream centre. Plain Delicious. Halloween isn’t a huge thing for us in this house, but, it’s autumn and pumpkins are everywhere. I like to take advantage of this fact. And let’s face it, letting my girls carve out a pumpkin lantern doesn’t seem that bad because I’m then left with a pile of pumpkin flesh ready for making into Pumpkin Pie Whoopie Pies. For the last three years this is what we’ve done. If you are not into pumpkin, don’t be put off, this is the one time all year that anybody in this house eats pumpkin. It’s a texture thing – sorry. But it seems we are all willing to get over this issue for the sake of a few Pumpkin Pie Whoopie Pies. Maybe it’s because they’re so large. The fun starts with the carving out of the pumpkins, kids adding faces while I clear up the mess seeds and roast the pumpkin flesh. 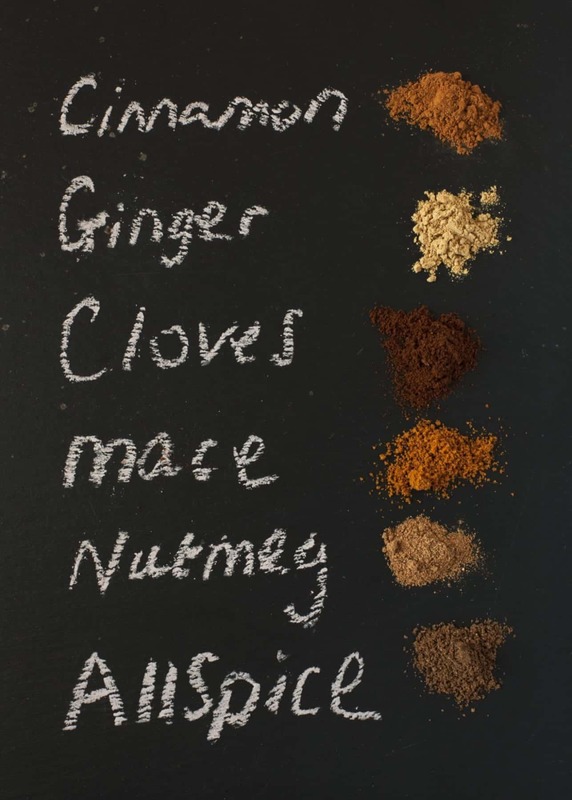 Next, the spice mix – cinnamon, cloves, ginger, mace, allspice, nutmeg all mixed up in a bowl filling your kitchen with a warming autumnal aroma. Then there’s the filling – closely related to buttercream, but involving vanilla and marshmallow – posh buttercream. 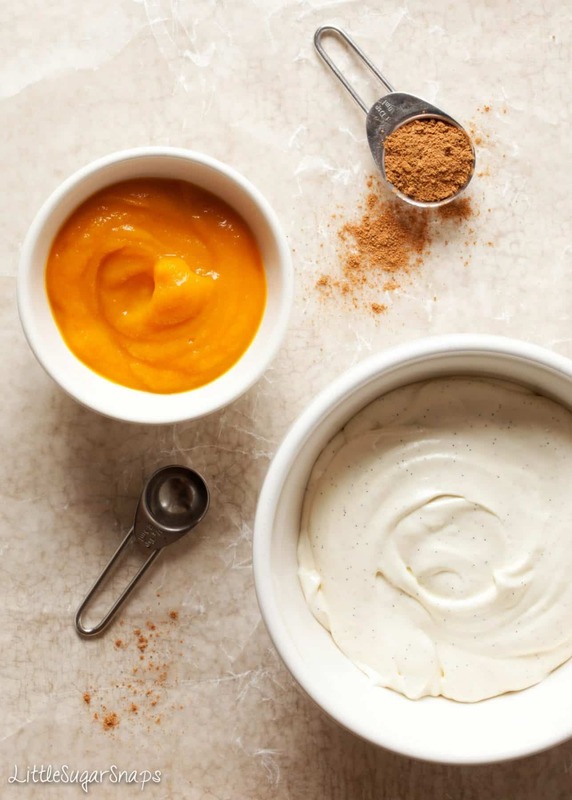 These are the star ingredients – fresh pumpkin, spice mix, posh buttercream. But what exactly is a whoopie pie? 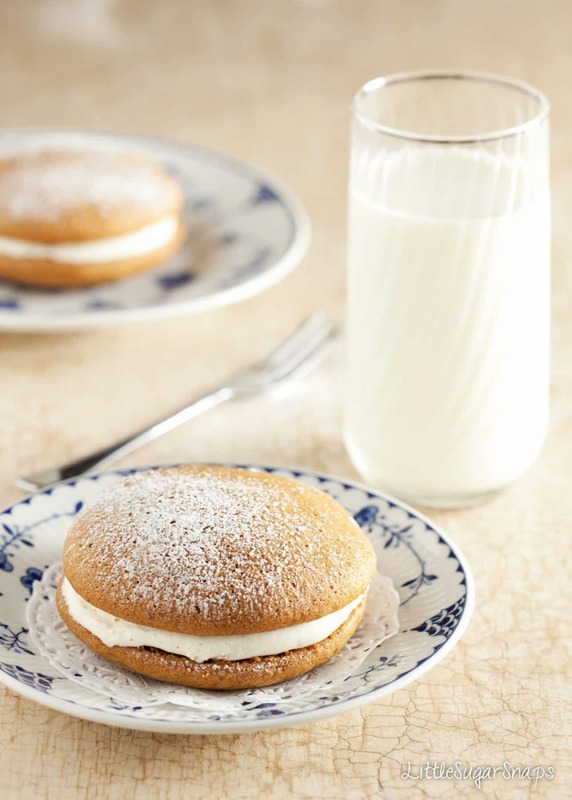 Whoopie pies originate from America. In fact, they are, apparently, the official State treat in Maine. (Don’t you just love the idea of an official treat?) Anyway, the whoopie pie is two domes of cake – usually chocolate – sandwiched together with a creamy filling. I like to think of them as free-form individual sandwich cakes as you just dollop the cake batter straight onto baking trays and away you go. No fiddling with paper cake cases involved (bonus). Oh, and did I mention how fantastically large they are? 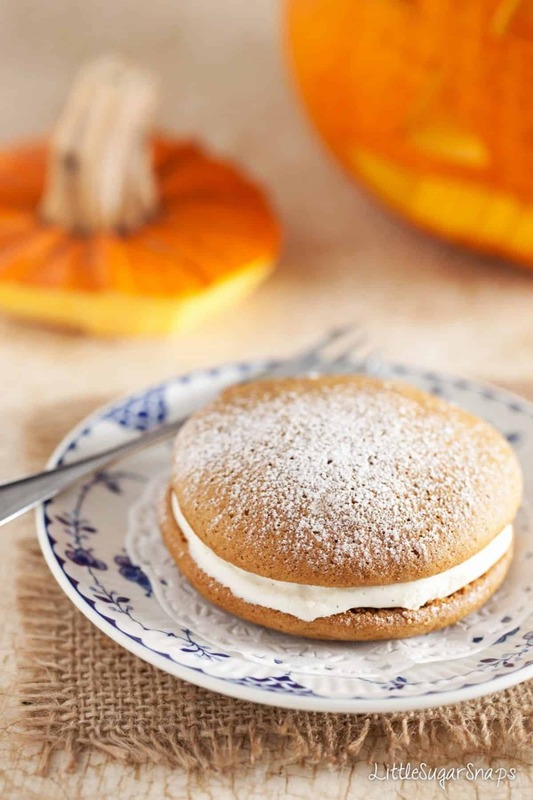 Confession: Whenever I make these Pumpkin Pie Whoopie Pies I always make an odd number of domes so that I can satisfy my eagerness and eat the extra one straight away. I can never wait until after tea to try one, sometimes not even for them to cool. On the plus side, if ever one breaks or falls on the floor during the sandwiching process I have a spare, though that would definitely lead to tears. 1.The ingredients for the spice mix will give you enough to make this recipe about 3 times. 2.To make the pumpkin puree remove the seeds from the pumpkin, then scoop the flesh out. Wrap in baking parchment and roast at 180ºC/ 350ºF/ GM 4 for 30 minutes. Allow to cool then blitz in a blender until smooth. These whoppie pies look SO incredibly delicious! loving the pumpkin flavour especially.. These look absolutely incredible! I love soft frosted cookies, so these would be a hit with me for sure! Carlee, thankyou. Hope you enjoy them. Perfect! I’m always looking for more casual desserts to take to my in-laws during the holidays! I know these will be a hit! And how smart to make an odd number. Lol! tee hee Erin, we cooks have to be clever and sneaky. Enjoy the bake and sharing them with your family.